I was looking for something a bit simple tonight. 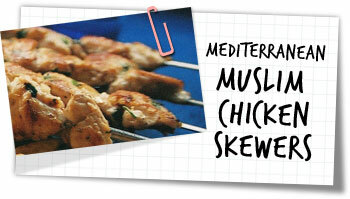 This eastern Mediterranean marinade for chicken jumped off the page as just that. The recipe was originally for lamb, but as I found out it works equally well for chicken. It’s pretty low effort, with high flavour return – the chicken was succulent and very tender. The perfect meal for my lazy mood. Mince the garlic and salt together in a pestle and mortar. Add the pepper, coriander and grind more. Stir in the tomato, lemon juice and olive oil. Pour this over the chicken and coat well. Cover and marinade in the fridge for at least 1 hour. Overnight is best. Soak some wooden skewers for 1/2 hour then thread some pieces of chicken on. Repeat with all the chicken. Drizzle with a little olive oil then place under a hot grill till slightly charred (about 5-7 minutes), turn over and grill for another 5-7 minutes (depending how chunky the chicken is). Check the chicken is cooked, rest for 1-2 minutes then serve. Serve with salad. I ate mine with this delicious mediterranean bread salad and a dollop of humus.